DT Ondre Pipkins could be set for a big year in 2013. Previously, we looked at the offense. We also looked at the schedule. Now it's the defense's turn. Michigan loses 5 official starters on defense...Will Campbell, Craig Roh, Jordan Kovacs, JT Floyd and Kenny Demens. On paper, this seems like a lot. But if you look at what's coming up, your fears will be eased. Much eased. 2012 was a moderately successful season for the Michigan defense, but a step back statistically from 2011. Given the 2012 schedule, can anyone honestly be surprised. Nationally, Michigan ranked 13th in total defense, 52nd in rushing defense, 5th in passing defense and 19th in scoring defense. Good numbers, but far from what it's going to take to win the Big Ten and do the things that Michigan coaches and players want to do. Team 134 can do better, and they will do better. Hit the jump to find out how. Check out the depth! No srsly, check it. In a vast departure from the Rodriguez era, Michigan has begun to restock the cupboards on defense. First was the secondary, now comes the defensive line. True, currently there's no obvious Mike Martin or Brandon Graham, but there's some serious contenders. Jibreel Black, Frank Clark, Quinton Washington, Nathan Brink, Ondre Pipkins are ripe for taking that next step. Brendan Beyer, Keith Heitzman add some much needed depth. And with guys like Strobel, Wormley, Godin and Henry coming off redshirts, this group could be one of the best in the league. With Hoke, Mattison and Montgomery leading this group to glory, expect nothing less. 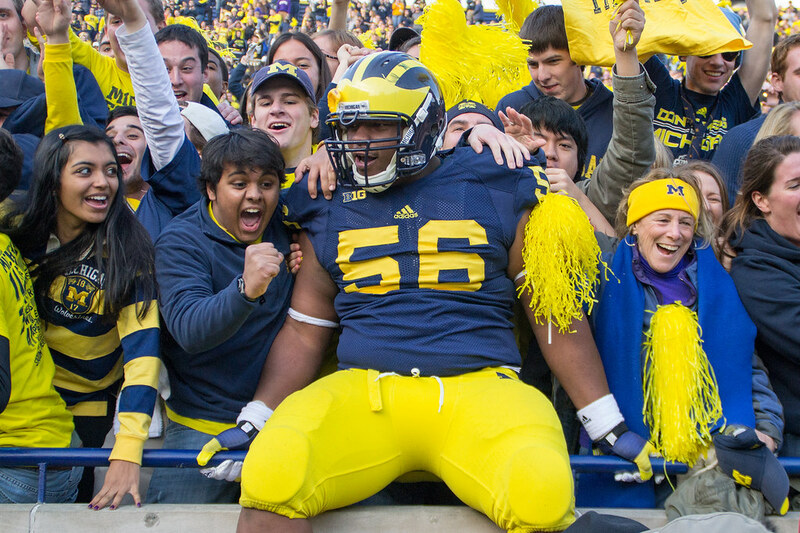 I personally can't wait to see a healthy Chris Wormley work his way quickly up the depth chart. I think he could've done that last season. The loss of BWC and Roh will be minimal. It took Campbell 4 years to figure out he could be a dominant DT, yet still he never materialized. Craig Roh was an adequate DE, flipping from weak to strong side more than once, but with the absolute glut of talent coming up behind him, he won't be missed. Demens will be missed. He was missed in the bowl game. In his place, Ross, Morgan and Bolden are sure to step up. The MLB spot is covered. Jake Ryan (Manster) has the strong side on lockdown like no one has had it at Michigan in years. If you need me to come on here and convince you of this, you're not a Michigan fan. Please leave. On the other side, whoever doesn't fill the role in the middle will likely go here...I'm looking at you James Ross. Former walk-on turned everyone's hero Jordan Kovacs is gone. He was an undersized and, dare I say it, under-talented safety who played well above his pay-grade for about 3 years. His senior year, he had some ups and downs. The downs were mainly exposed by fast receivers. The last touchdown of the South Carolina game will be how I remember Jordan, unfortunately. For 2013, Michigan brings back the bulk of the talent from the nations #5 passing defense from 2012. Blake Countess comes back from injury, which should ease the loss of JT Floyd, if not erase it entirely. That should also shift Avery back to a full-time nickleback and Marvin Robinson to the safety spot. Between Raymon Taylor and Terry Richardson, the other corner spot should be taken care of. Thomas Gordon could shift to strong safety, but I doubt it.